1) It is the trait of those who are rebellious to the laws of Allah, that they are always under stress. Suffering from anxiety and sorrows, always complaining and moaning. Allah (swt) says all the hardships and trails that come our ways is in the knowledge of Allah. In islam we believe that nothing happens in coincidence. Since hardships and trails that we face is in the knowledge of Allah. He (swt) tells us why we face them on the life of dunya aswell. The reason is so that we return to Allah. Many people despite having everything are in stress and turmoil. This is a example of how Allah (swt) wants people to turn to him. However we tend to do the opposite. We complain and move more away from Allah. When it should make us turn to Allah more. People continually ask for guidance. Allah (swt) wants to guide us. However we are far away despite asking Allah for guidance. -Revelation is only revealed upon the prophets. no one else receives revelations. This brings the question, how does Allah then communicate with normal humans. – in relation to giving us lessons, to turn to him and not be deluded by the dunya? He (swt) does so by the tests and trails he sends our way. With these Allah (swt) is telling us to turn to him. All the stress of the dunya, bills, financial, social, economical problems etc are small trails Allah sends us. Before we receive the great trail and hardship of the hell fire. 2) secondly, one of the reasons why we face hardships is also because, when someone turns him/herself away from Allah and his prophet (saw) then the mashaykh and ulema say Allah (swt) attaches a jinn with the individual. This is why we face hardships and go under stress and hardships. Some people came to imam Ahmad Ibn hanbal (ra) and said such ad such a woman is affected by jinn. He (imam Ahmad Ibn hanbal) said take my sandals and say to the jinn that is affecting the woman to leave otherwise it will be hit by this sandals. The jinn replied I do not care if I get hit by the sandals. 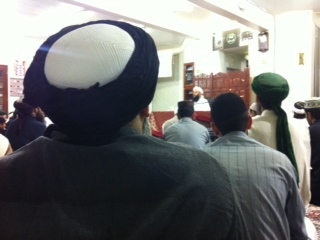 But I have immense respect for the shaykh. Because of him I will leave this woman and not only that but leave the whole country of iraq. – This is a example of how Allah give respect and honour to his friends, in the hearts of all the other creations. When hardships come instead of turning to Allah. We tend to turn away from him. This is what Allah tells us. We do not correct our actions, and instead shaitan tells us and glorifies our actions to us, in the sense of it being correct. So, when hardships as illness comes our way we need to turn to ourselves and see what we are doing wrong and correct our selves. If we do we will not need to turn to doctors and nurses for our cures. We will receive the divine cures and successes of Allah (swt). Previous PostHow good deeds are acceptedNext PostLoving the prophet (saw) according to Allah.